This entry was posted in Crossover and tagged 2013, Crossover, Crosstrek, Driver, Everyman, Review, Subaru on May 20, 2014 by Sam. 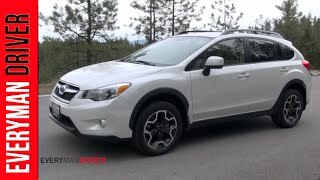 A Great Review from Everyman Driver on the 2013 ‪#‎Subaru‬ XV Crosstrek. the panoramic sun roof I had with the forester, isn’t in the new crosstrek. I like u guys reviews!!! Can u guys do a review on 2013 4runner please!!? can depend on for new videos. What about non pavement performance? It’s a crossover not a motorcycle. shows no signs of slowing down yet. the CVT at any rate. Did you guy drive one with the manual? previous poor Nav units. Not sure which at this point. a 2013 S4 keeping with your theme on AWD cars. That “limited” crack was no knee slapper…. environments. Let’s hear that CVT on an on-ramp. Keep up the good work! are. But again, great review. one you think is best. Subaru interior looks cheap in every model.